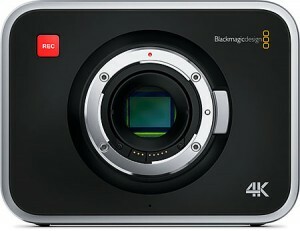 Shoot Ultra HD TV or 4K feature films with the new Blackmagic Production Camera 4K. You get a large Super 35 size sensor with professional global shutter combined with precision EF mount optics, high quality visually lossless compressed CinemaDNG RAW and Apple ProRes 422 (HQ) file recording for a complete self contained solution. 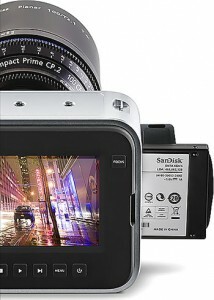 The built in touchscreen lets you monitor, change settings and enter metadata directly on the camera! The latest high end televisions and video projectors support Ultra HD which is four times the resolution of 1080 HD. The Blackmagic Production Camera 4K creates visually lossless compressed CinemaDNG RAW and ProRes 422 (HQ) files that are perfect for editing and grading with the software tools you already own. Now you can shoot the most amazing high resolution music videos, episodic television productions, television commercials, sport, documentaries, interviews and feature films. The Blackmagic Production Camera 4K features a single 6G-SDI output for incredible Ultra HD live production. The Blackmagic Production Camera 4K is precision engineered for quality in an incredibly small size. You get a beautifully crafted design featuring a machined aluminum chassis, EF lens mount for interchangeable optics, high resolution 4K Super 35 size sensor, global shutter, visually lossless compressed CinemaDNG RAW and ProRes 422 (HQ) file format. With built in uncompressed audio recording you can record professional audio straight to the ProRes files and totally eliminate separate audio syncing during post production. With a large Super 35 size sensor you get familiar framing and behavior from the lenses you already own! The sensor features a global shutter so you get perfect panning and with minimal crop factor you also get beautiful wide angle shots from your wide angle lenses. If you’re working in HD you’ll love the freedom to reframe and zoom into shots without any resolution loss, and when down scaling from 4K to HD you get incredibly smooth and clean images. With the EF compatible lens mount you can choose high quality optics that are designed to take advantage of the large Super 35 size sensor with minimal cropping. Use the world’s most amazing optics from leading lens crafters like Canon, Zeiss and more, with full electronic control! The EF compatible lens mount means you’re not locked into a specific lens, so you have the freedom to work with professional cinema lenses using rails, follow focus and other professional accessories! Capture 4K ProRes directly to a removable SSD! With a built in SSD recorder, Blackmagic Production Camera 4K easily captures 4K in ProRes 422 (HQ) and compressed CinemaDNG files. You get a 4K camera designed from the ground up to be part of your post production workflow! Capturing to a removable SSD means that once you’ve finished shooting you can simply connect the SSD to your computer and edit or color correct your shots straight from the disk! Disks can be formatted in either HFS+ or exFAT for Mac and Windows compatibility. 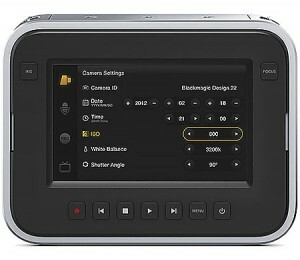 Unlike traditional cameras that record obscure file formats that take time to convert before you can start post production, the Blackmagic Production Camera 4K records directly to files that are compatible with your editing software. The wide dynamic range of the Super 35 size sensor can be mapped into the quantizing range of the file, so you can color grade shots with greater detail in highlights and shadows. If you’re working fast, simply select ‘Video’ and shoot in regular REC709 color space. 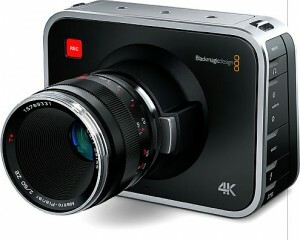 Blackmagic Production Camera 4K has been designed with portability and durability in mind. With standard connections and an internal battery inside a beautiful machined aluminum design, you can be confident that the Blackmagic Production Camera 4K will easily handle the rigors of location work! A high resolution LCD display shows settings such as shutter speed, color temperature, aperture and timecode in an easy to read status strip. Use the capacitive touchscreen to access menus to change settings such as recording format, shutter angle and more! Double tap the screen to zoom into the image for fast and accurate focus. Tap once on the screen to display the metadata entry page where you can enter information such as shot number, search tags, scene number, timecode and more. You can even set shot number and other data to increment automatically! This metadata saves directly into your files and is compatible with popular editing software. Managing your files in post production is now much simpler! With 12 stops of dynamic range you get amazing looking images beyond those of regular video cameras or even the highest end broadcast cameras. All this dynamic range is captured into ProRes or CinemaDNG files at 4K resolution, so images retain a beautiful film look. By capturing more detail from the sensor you can make creative decisions during DaVinci Resolve color grading! You can really push the shadows or highlights in either direction and preserve fine details in the image! Effective Sensor Size: 21.12mm x 11.88mm (Super 35). Shooting Resolutions: 3840 x 2160, 1920×1080. Focus: Focus button turns on peaking. Iris Control: Iris button automatically adjusts the lens iris settings so no pixel is clipped in film mode. Scene average auto exposure in video mode. 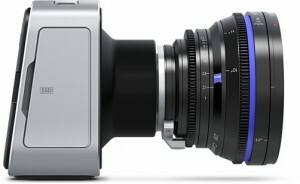 Lens Mount: EF and ZE mount compatible with electronic iris control. Screen Dimensions: 5″ and 800 x 480 resolution. Screen Type: Integrated LCD capacitive touchscreen. Metadata Support: Automatic camera data and user data such as shot number, filenames and keywords. Controls: On screen touch menus and physical buttons for recording and transport control. Mounting Options: 3 x 1/4″-20 UNC thread mounting points on top of camera. 1 x 1/4″-20 UNC thread tripod mount with locator pin. Broadcast Pros can help you turn your surplus video and audio gear into cash. We purchase used professional equipment, and can also arrange for consignment or auction sales.